palace – Travel. Garden. Eat. 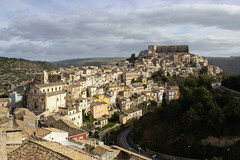 When you are from Minnesota packing for a special summer trip to Italy, you obsess that the Roman July heat and humidity will put a damper on your travel plans, as you still have not packed away your fleece yet. With the outrageous baggage fees charged by airlines, packing light is essential, and those suitcases need some wiggle room to accommodate the anticipated souvenirs and street market purchases. Although we scheduled a quick three days in Paris at the front end of the trip, I had spent most of my planning (and packing strategy) energy on the balance of our two-week travels, all much further south in Italy. 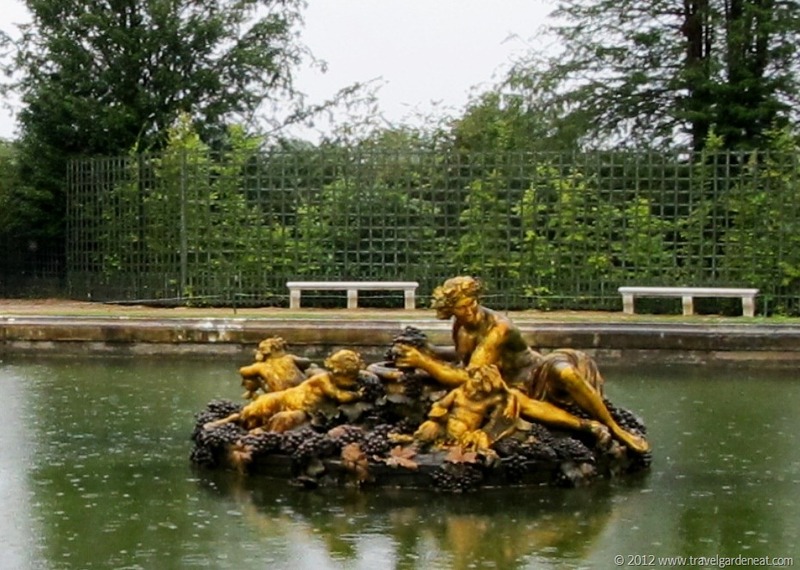 Usually being the over-planner, I threw caution to the wind and said, “what are the chances of needing a jacket in Italy, given that their coolest evening temps are still a nice northern Minnesota summer day!” I regretted that decision for our day trip to Versailles. 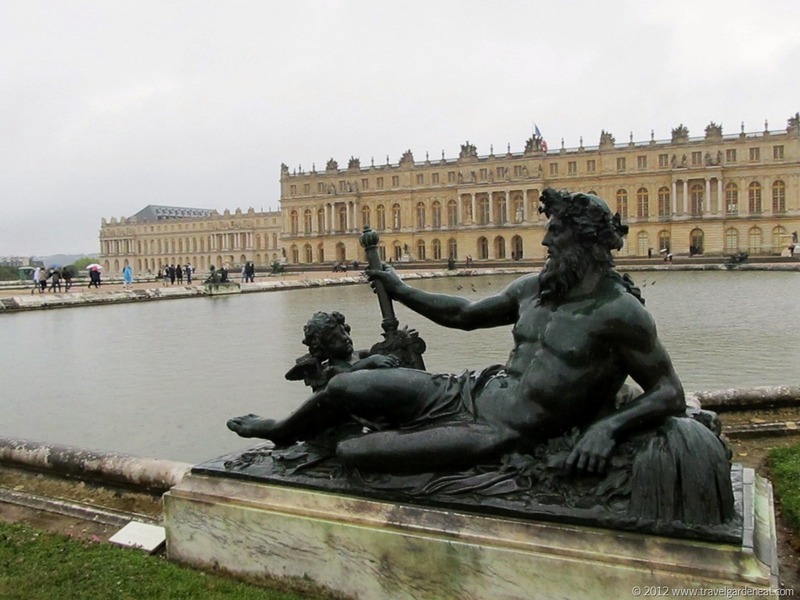 The Palace of Versailles is a convenient train ride from Paris. The history of the Palace is fascinating. 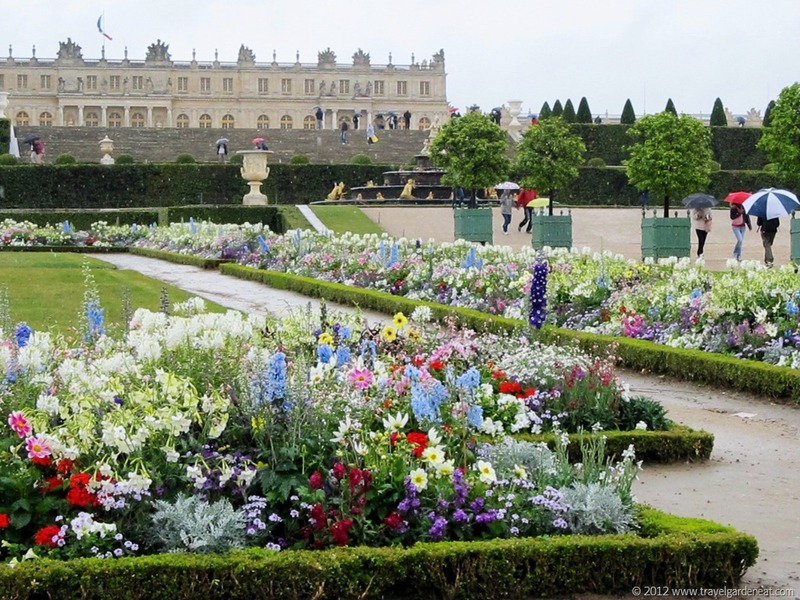 The decor and grounds of the Palace reflect the colorful life of King Louis XIV and tragic life of Queen Marie Antoinette, as well as the significant historical events contemporaneously occurring outside of Versailles. The mid-July day dawned gray and gloomy . . . and wet. 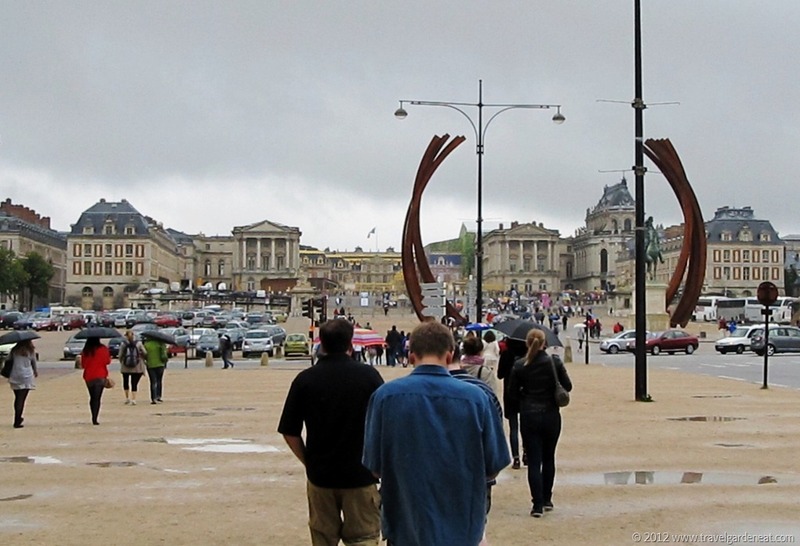 We had two umbrellas with us and made two street vendors happy by purchasing two more as we walked toward the massive palace. 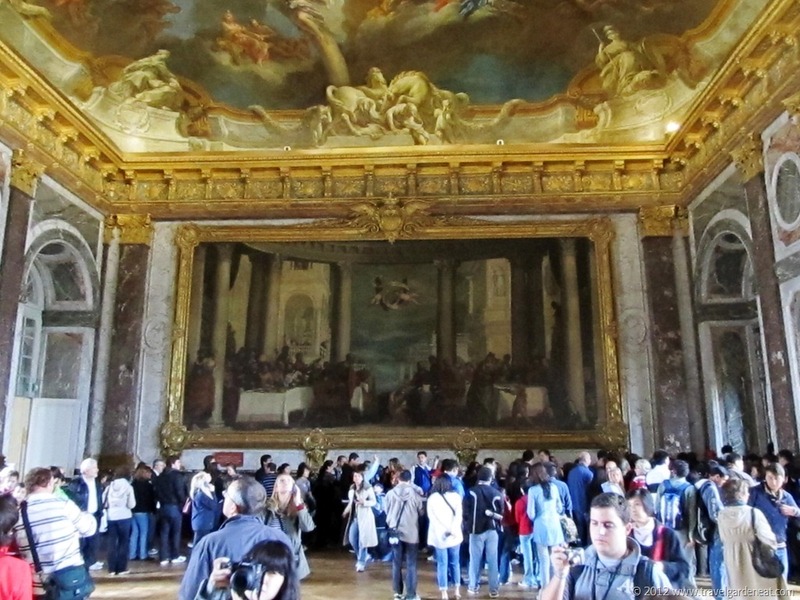 We had purchased the Paris Museum Pass, which saved us wait time at many attractions. 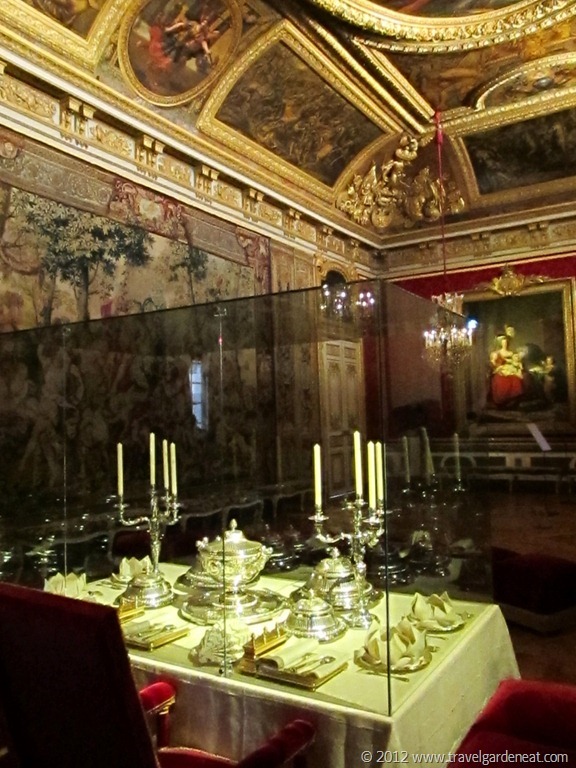 Not so at Versailles. 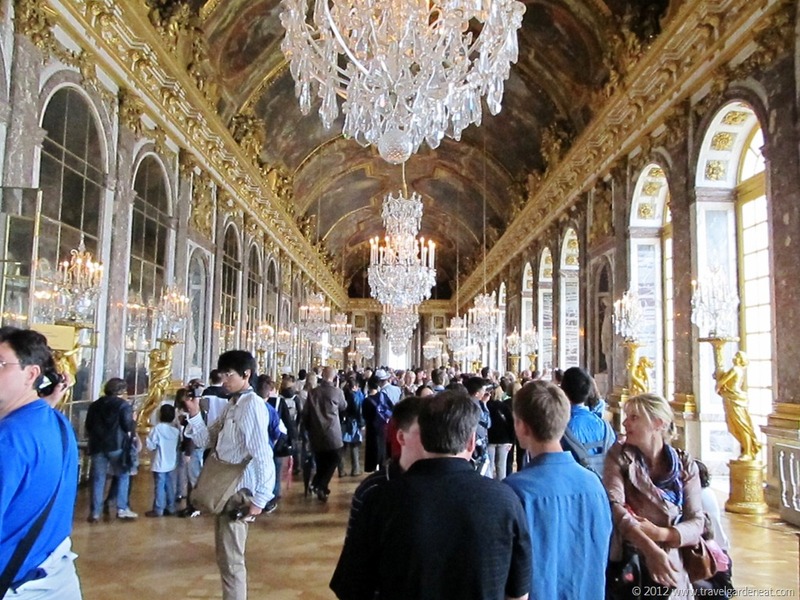 We stood in the long, winding line outside of the Palace, with the other cold, wet, miserable tourists, just for the privilege of seeing the interior. 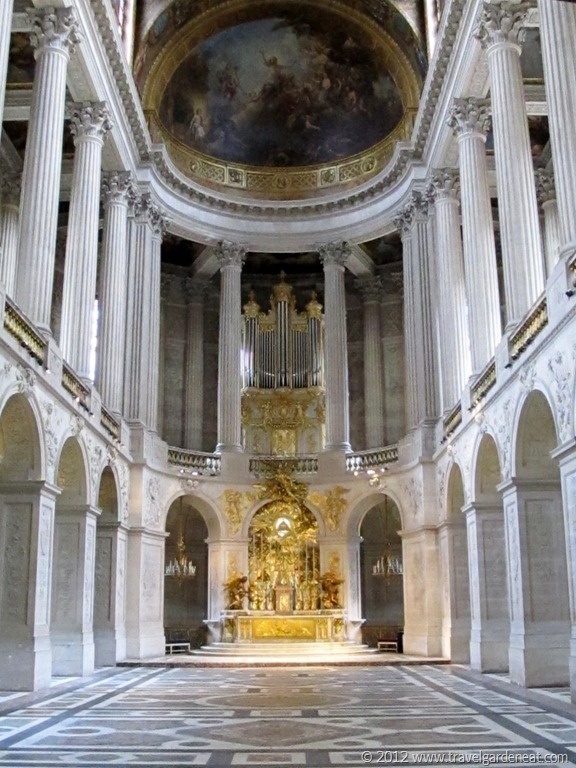 Once inside, the images were magnificent! 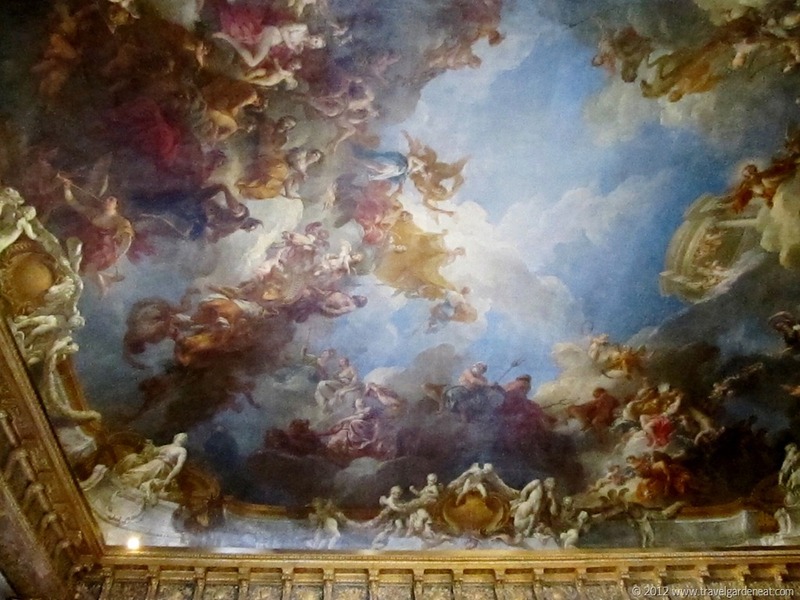 Over-the-top decadence, furnishings and art fit for the Louvre’s finest galleries. 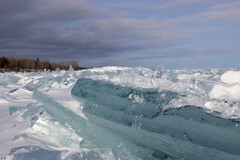 And enough rude tourists to make a person say, “never again” (at least not during the high season)! I would observe with glee when a security person “caught” a tourist trying to cut through a room and disregard the marked path of the tour, in an attempt to jump ahead of the slow-moving hordes of people. 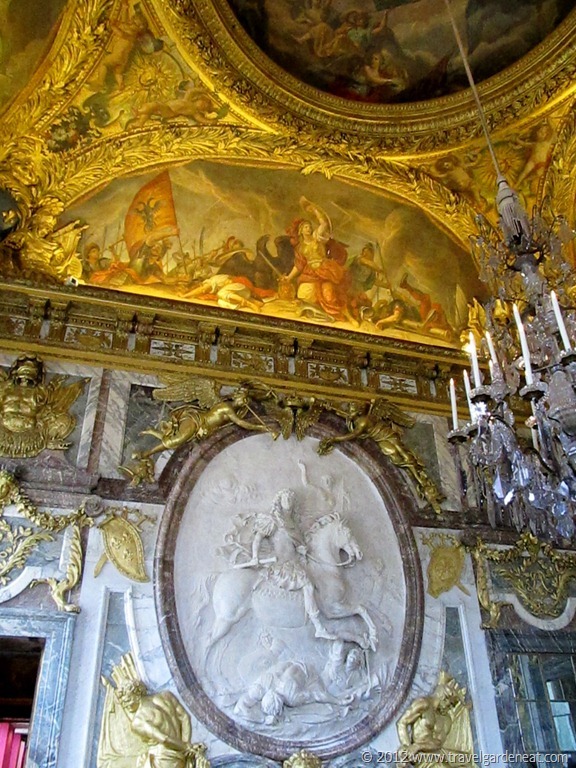 I admit to being quite crabby in between the stunning images of each room. And, if I was crabby about feeling like a cheap sardine in an overpacked can, I cannot begin to put into words how my husband felt by the time we escaped. 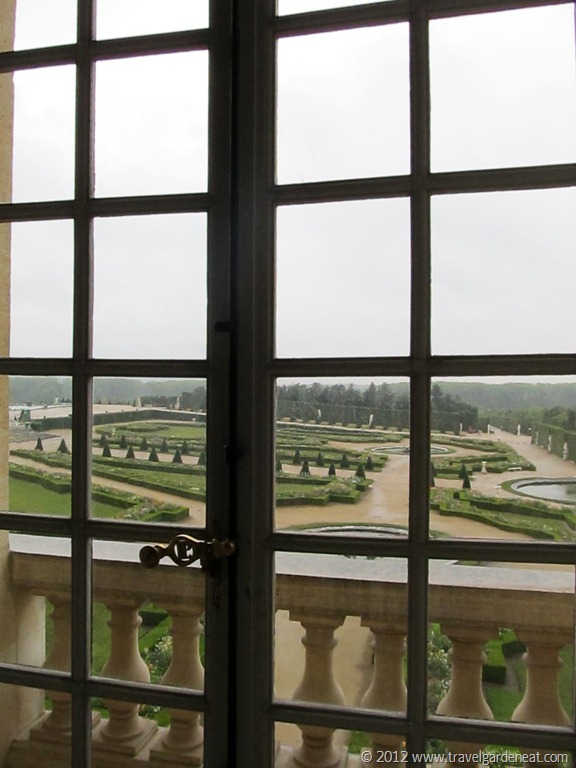 We caught glimpses of the famous gardens on the massive estate as we walked from room to room. At the end of our self-guided tour, the Hall of Mirrors (where the Treaty of Versailles was signed in 1919, confirming the end of WWI) was as breathtaking as depicted in all of the guidebooks, and provided some consolation for otherwise feeling like cattle being funneled through narrow chutes on their way to the stockyards. 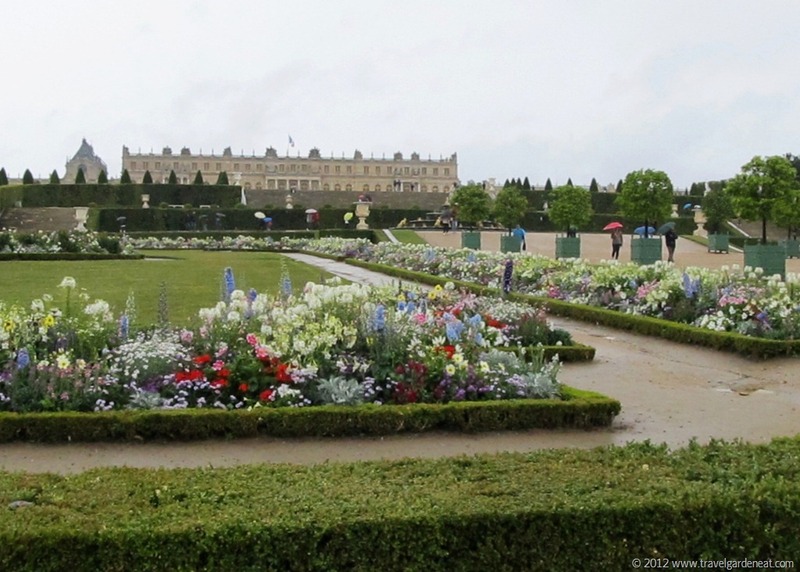 While I enjoyed seeing firsthand the indescribable luxuries of Versailles’ interior, what I really had been looking forward to touring were the gardens. 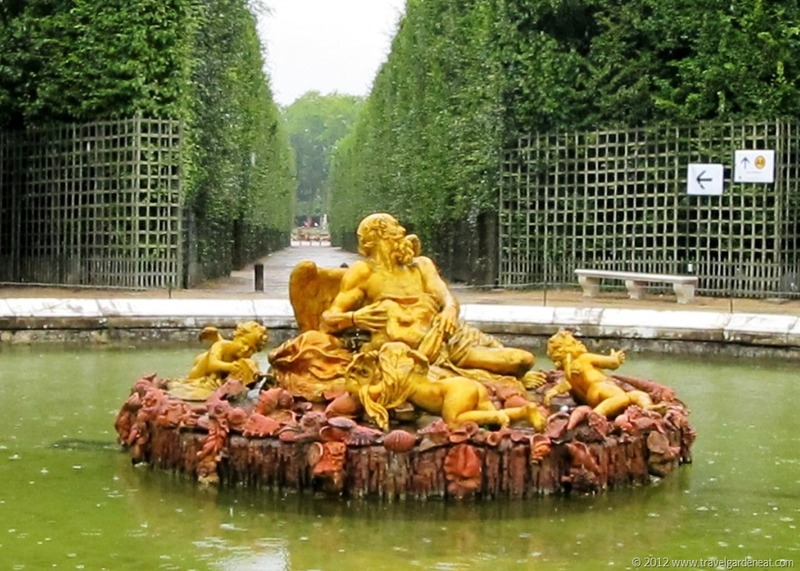 After we escaped the crowds, and walked to view the Fountain of Latona looking toward the Grand Canal, my hopes of renting bikes and idyllically biking around the Gardens of Versailles with my husband and two teens wilted like my garden flowers after the first hard frost. The enthusiasm of my traveling companions was waning the longer we stood outside and tried walking to some of the closest gardens, jumping puddles, feeling chilled, with mutiny building among the troops. 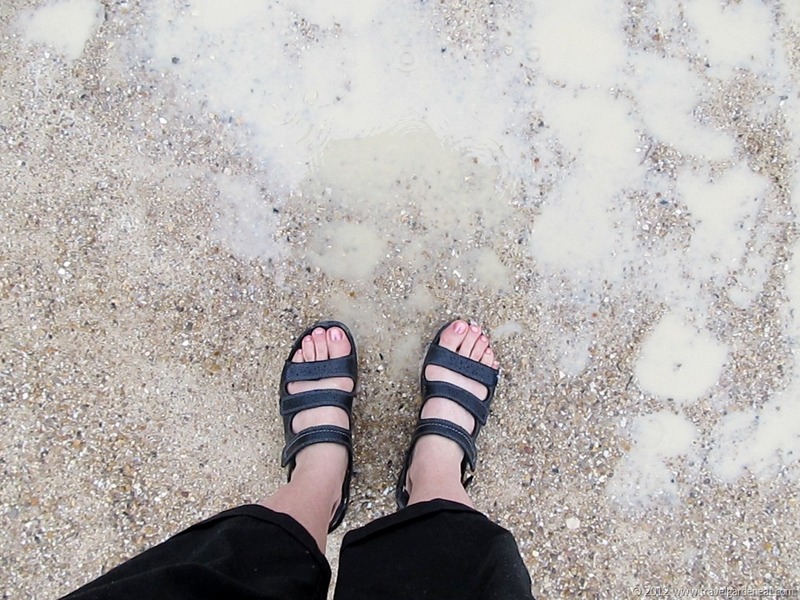 My toes were not yet numb, but we all admittedly were underdressed for the weather (incredibly out of character for we Minnesotans who are used to packing for three-season weather almost every weekend). And the rain, rain, rain kept coming down, down, down. Minnesota nice was gone, and I believe the following words (or something close) came out of my mouth at one point: “Fine, if you don’t want to see the gardens, you can go stand under that alcove until I am done. 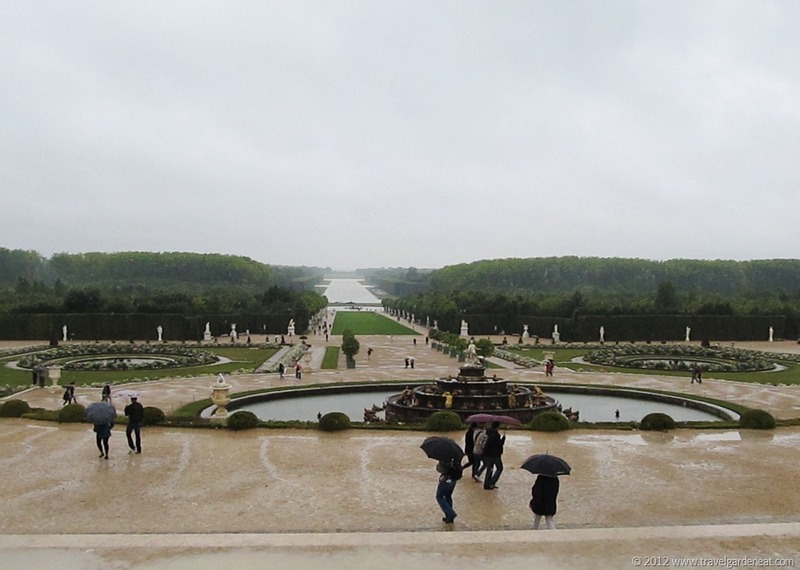 I didn’t travel all the way to Versailles to stand at the edge of the estate and take a picture.” I am sure it was said in the nicest of tones, though, which resulted in a dour trio dragging their feet behind me as we trooped onward. 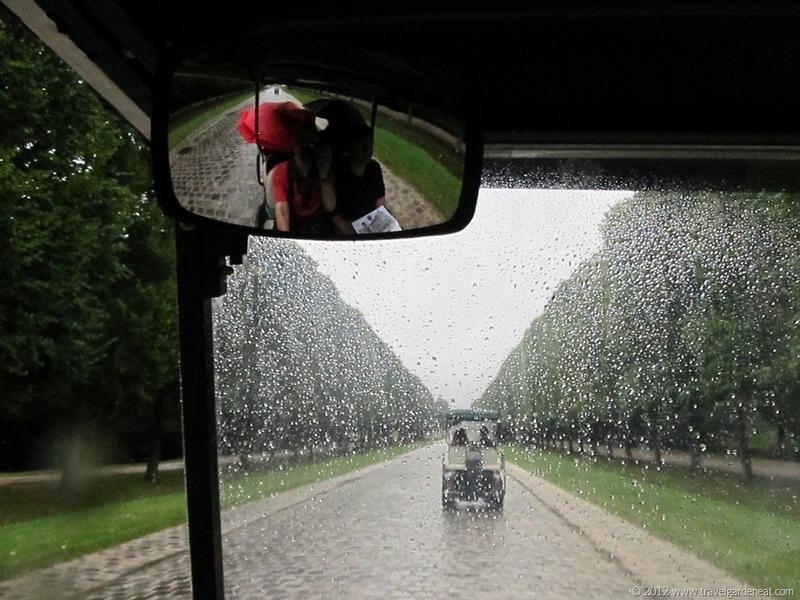 And then I saw the golf carts — motorized, timed golf carts for which you paid an exorbitant rental charge (particularly given the Euro-U.S. Dollar exchange rate that summer) to toodle about the gardens. SOLD (or at least rented for a couple of hours)! That cart appeared to me as good as a limousine at that point, with a canopy overhead and feet off of the wet ground. 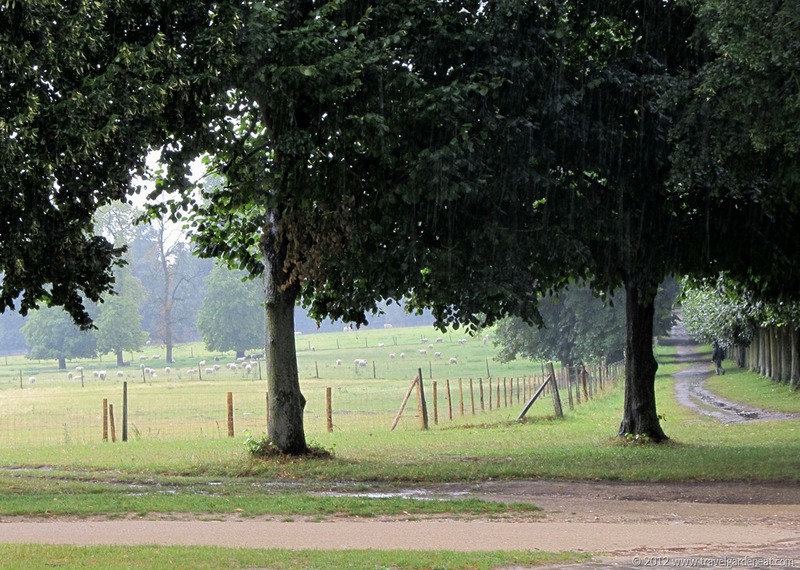 We certainly did not have the tour of the gardens I had envisioned before embarking on our journey, but we saw more of the estate than we would have otherwise on that cold, dreary day. 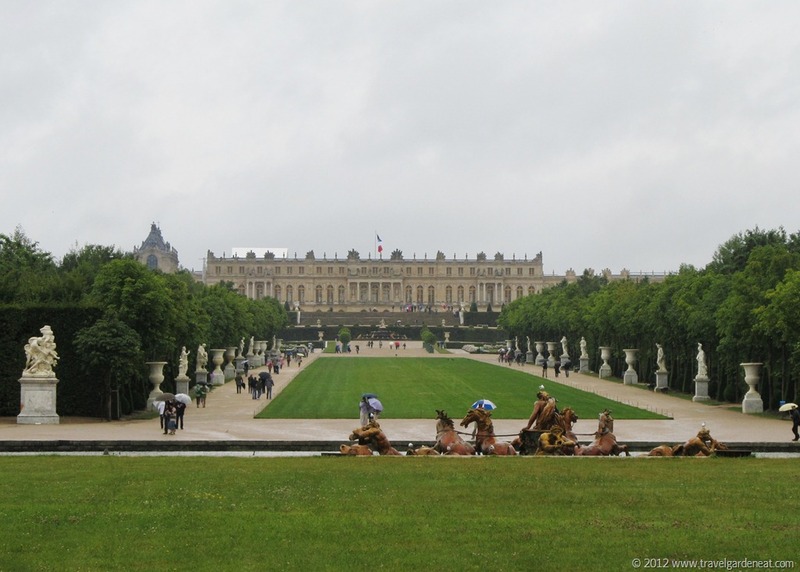 The majestic scale of Versailles cannot be fully appreciated without venturing out onto the grounds of the estate. The flowers stood out in colorful contrast to the otherwise gray day. 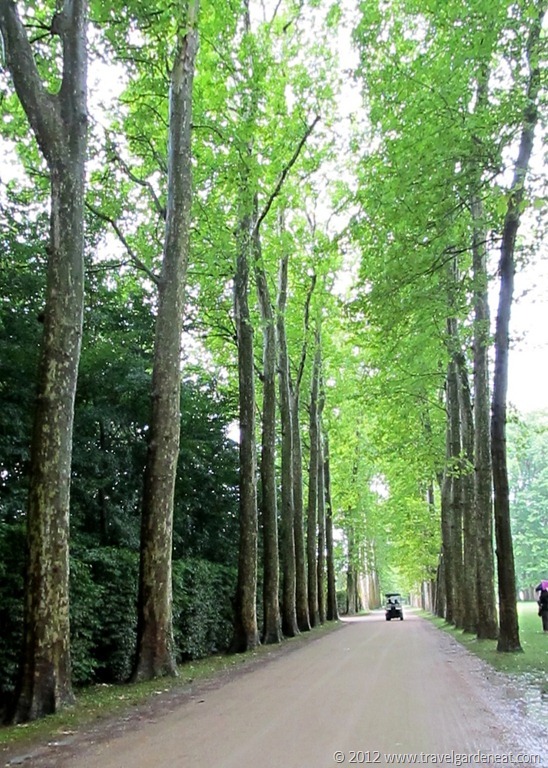 I can only imagine how beautiful the scene is on a calm, sunny day (which means we must return again some day to experience biking through the gardens, or taking a boat out on the Canal). The sun tried to peek through the clouds as we wrapped up our golf cart tour of the outer estate. 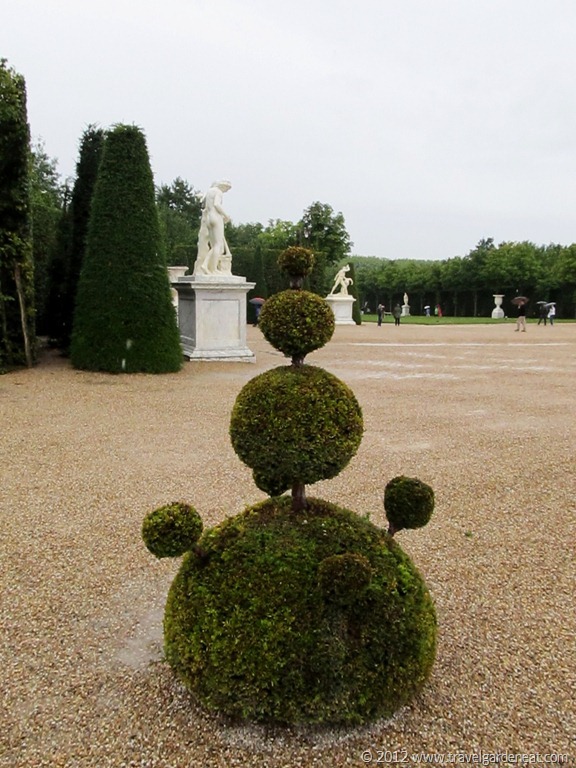 We learned that despite coming from the main Palace, which requires a ticket for entrance, you must be able to relocate and show your ticket stub to the security guard when returning to the main estate grounds from the Chateaux de Trianon. My husband is lucky he is not still wandering about the outer gardens. The security guard took pity on us, and apparently decided that if mom and two teens had ticket stubs, then dad must just be careless rather than dishonest.